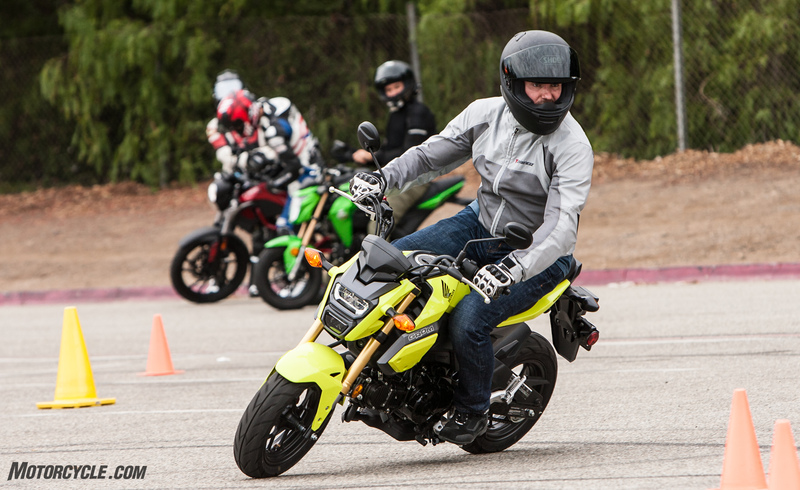 You can thank Honda for reigniting the mini bike craze with the release of the Honda Grom back in 2014. The little 125cc runabout is a refreshing throwback to the days you could grab your board, ride out to the ocean, hit the waves, then jet around town in search of the best carne asada burrito – while maybe sneaking into a skate park for a quick blast. In short, the Grom inspires fun rides at a slower pace. 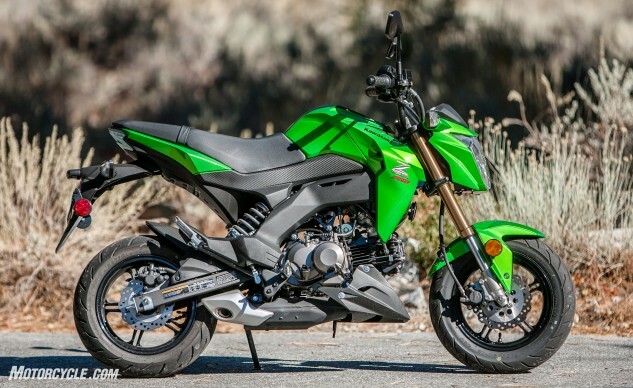 Now, with the success of the Grom, other manufacturers have kicked into action; Kawasaki was next to enter the little bike arms race with its Z125 Pro, and now we have two more entrants in the form of the Kymco K-Pipe 125 and SSR Motorsports Razkull 125. 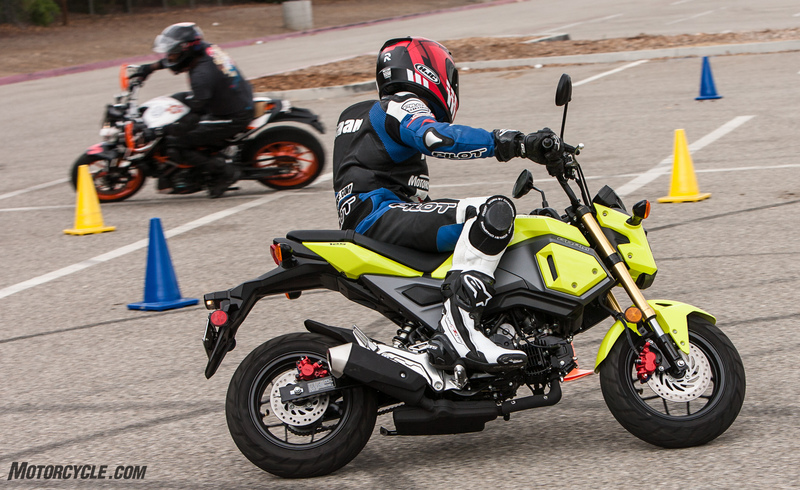 All three bikes follow the same basic theme of the Grom, with their small dimensions and low-tech, air-cooled single-cylinder engines providing minimal barriers to enter the sport of motorcycling. Curious how small these bikes are? 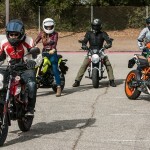 The KTM 390 Duke to the right dwarfs these little 125s, though at least the Kymco has 17-inch wheels like the KTM. 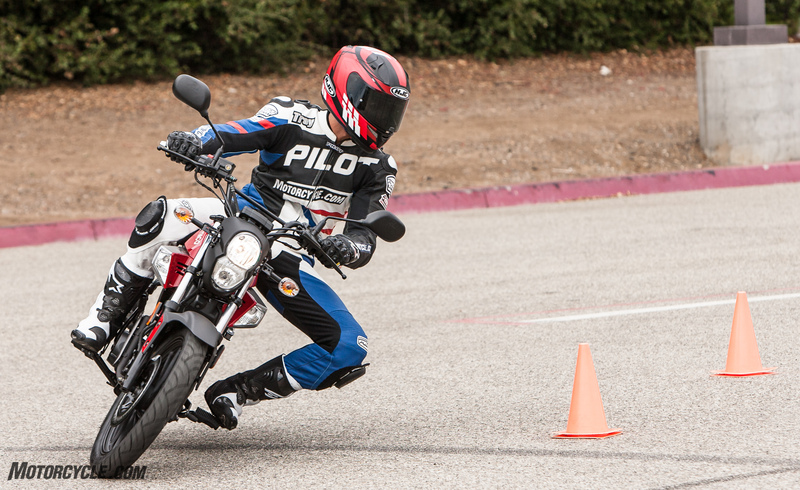 All four bikes have the perfect ingredients for a recipe that churns out new riders, so for this test we’ve gathered them all to see exactly which one makes the best learner bike. Since the MO staff aren’t exactly new riders (despite what some of you might think…), we’ve changed the script slightly and brought in a group of relative newbs to abuse them as only new riders can. 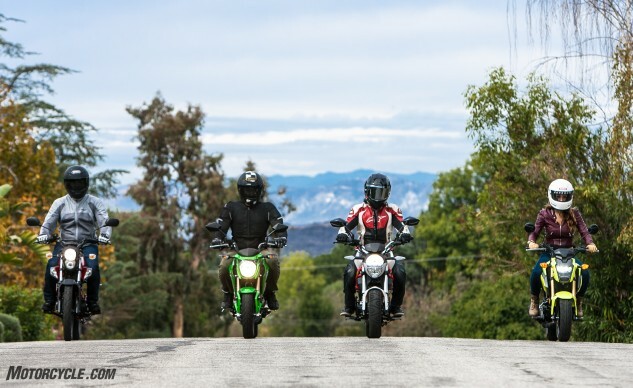 Their experience levels range from a couple months to a couple years, and quite frankly, they have a much better idea what it’s like being a new rider than we do. New riders don’t jump straight to trackdays, so we truncated the progression a new rider might take. 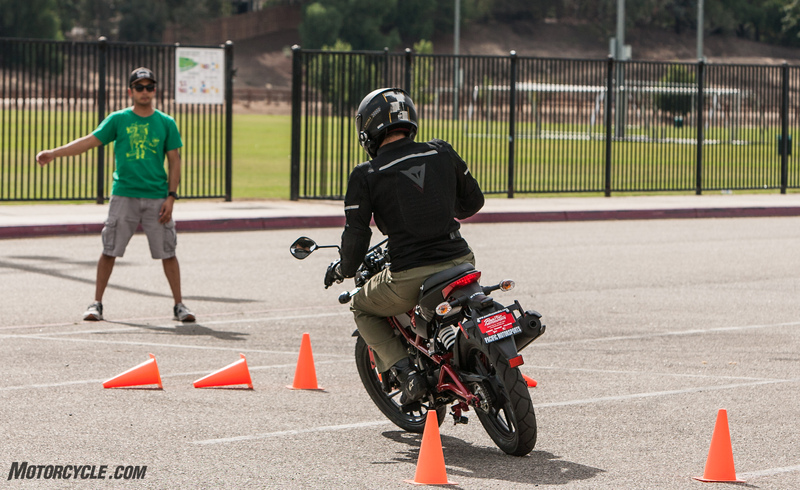 First came a parking lot skills test, then a brief real-world street ride. 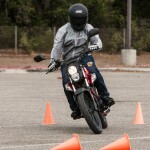 We capped the day with our friend James Bush, organizer of the M-Gymkhana series, who laid out a very simple motorcycle gymkhana course for our riders who wanted to tackle something a little more difficult. 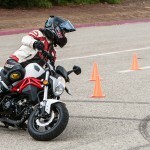 For those unfamiliar with motorcycle gymkhana, think of it as the MSF course on steroids. 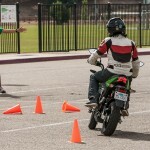 A series of cones are laid out in a specific pattern, different colors indicate different directions (including 270-degree turns), and the fastest time wins. 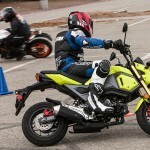 Clearly, we weren’t timing anybody this time, but the point of including the gymkhana course was to get a fuller idea of how these four machines respond in a variety of situations without risking danger on public roads. 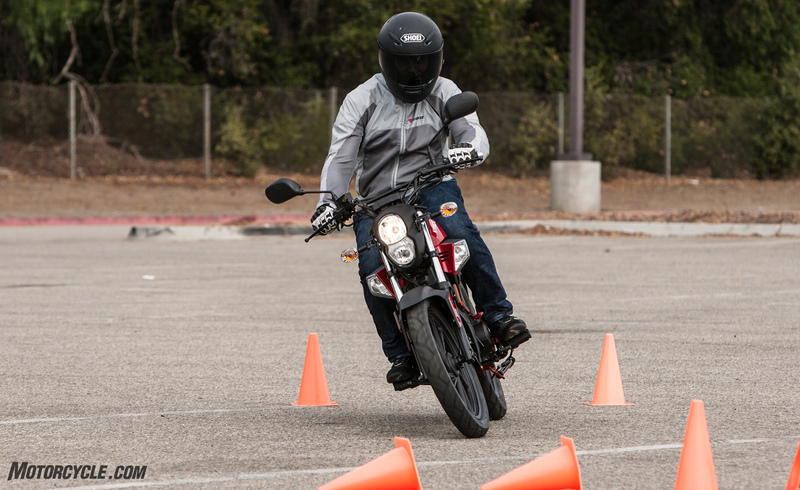 This testing also helped show that motorcycle control is a vital skill to learn no matter where you are in your riding journey. As you might have guessed from our title, there’s a second part to this story. 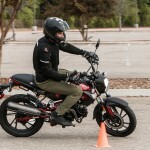 These 125 playbikes aren’t just for new riders, as experienced veterans have taken to them to let out their inner hooligan in a much more cost-effective fashion than with big bikes. People even go so far as to race these things on go-kart tracks for 24-hours (twice, even!) Exactly what we did with them will have to remain a secret until another time. 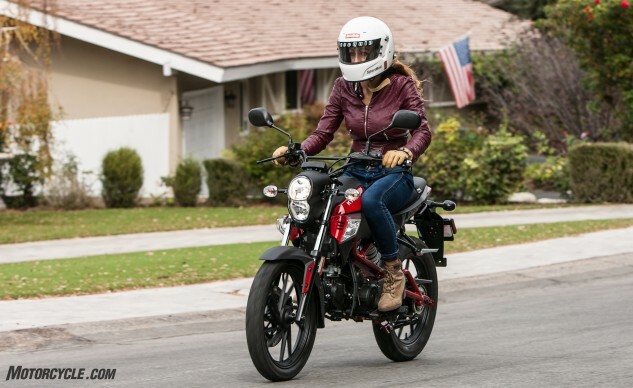 For now, let’s break down each of the four models and discover what some of our new riders liked and disliked about each one. And if you’re looking for details on each individual model, click the appropriate links above to read our reviews of each bike on their own. 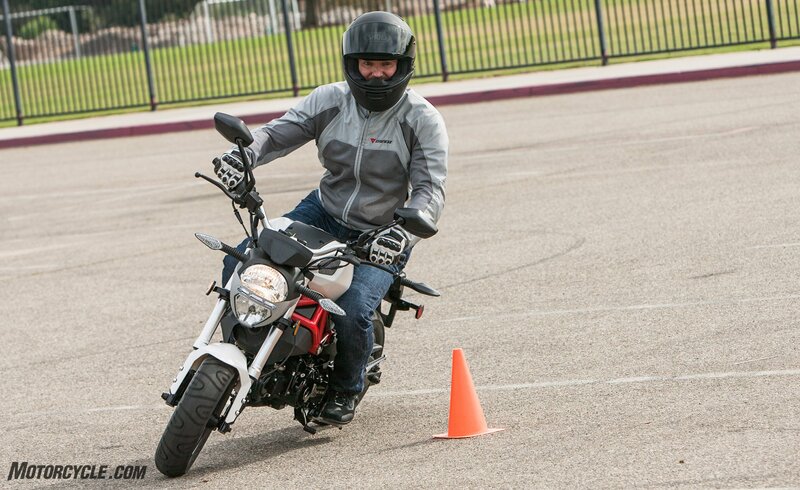 We start our journey into motorcycling with the Honda Grom. 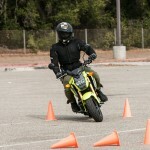 The originator of this 125 minibike craze, a simple Google search will reveal just how popular these bikes really are. 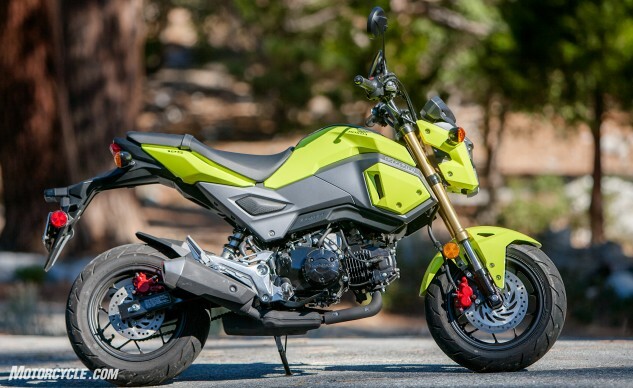 Honda gave the Grom a streetfighter-ish makeover in 2016 to veer slightly away from cute and more into the mean. More angular lines and, in the case of our tester, neon yellow livery help it stand apart in a crowd. 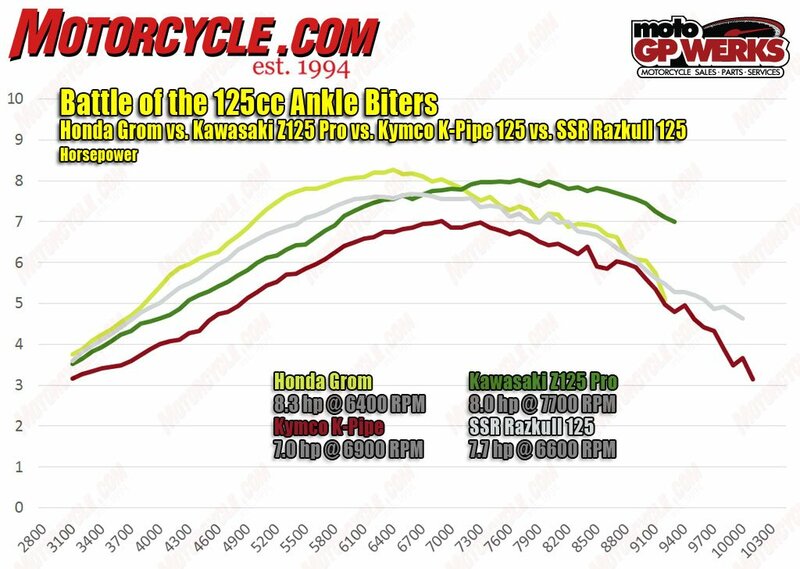 The mechanicals are the same though, with its 125cc Single pumping out 8.3 hp on the MotoGP Werks dyno and 7.6 lb-ft of torque – both numbers beating out the other three contenders here. The extra cash compared to the rest gets you the best fit and finish of the group. 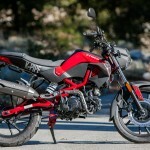 Apart from the the Honda’s finish, electronic fuel injection is largely the reason for having the highest price tag in the bunch, despite being built in Thailand like the Kawasaki. 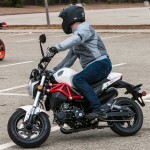 The tradeoff is not having to worry about managing the throttle and choke lever during cold startups (do new riders even know what a choke lever is?) 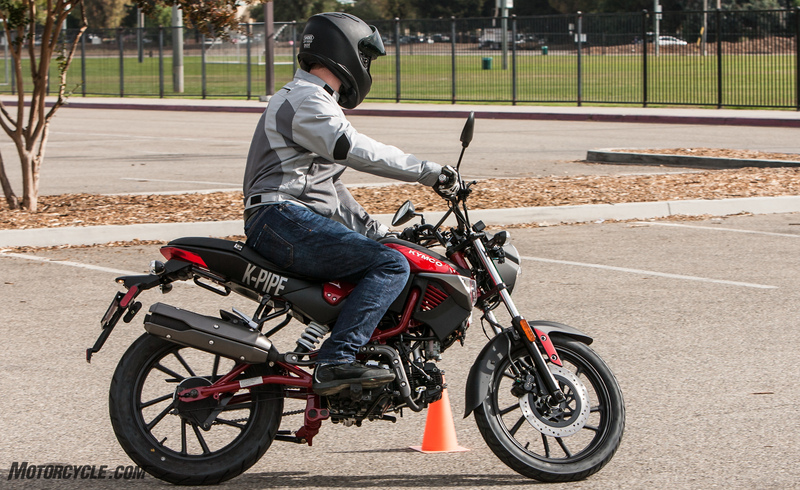 The EFI is smooth as can be on the Grom, resulting in easy-to-apply power deliver right from the off – an attribute our new riders didn’t fully appreciate until they rode the carbureted SSR and Kymco (more on that later). Managing the weave section of cones around our parking lot course was made easier on the Grom by not having to second guess how it would respond during the first few degrees of throttle turn. As a result, all the riders came to grips with the Honda the fastest. 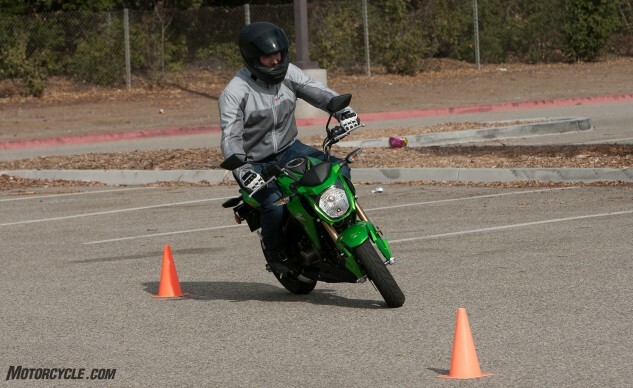 One of our guest testers, Arkady Trimolov, a Kawasaki Ninja 300 rider for about a year, also noted that the Honda was the easiest to maneuver at low speeds. 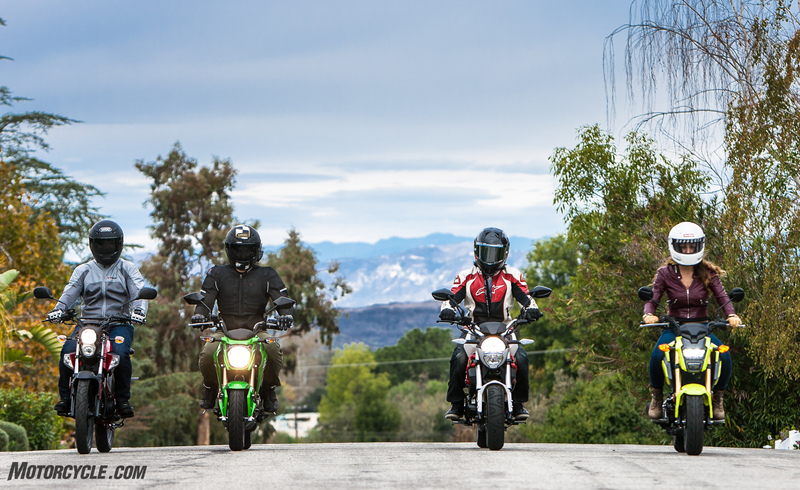 Except for the Kymco and its 17-inch hoops, the other three bikes here ride on 12-inch wheels. In the Honda’s case, the front is a 120/70 and the rear a 130/70. Handling feels neutral, with Trimolov calling it “precise.” Our other rookie testers, Arman Bedrosyan and Jenny Marie Horejsi, agreed. 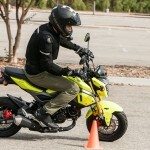 The Grom’s prowess wasn’t as distinguishable while riding slowly through our pseudo basic rider course, but out on the street and especially during the gymkhana portion, our riders found the Grom one of the easier bikes to navigate. 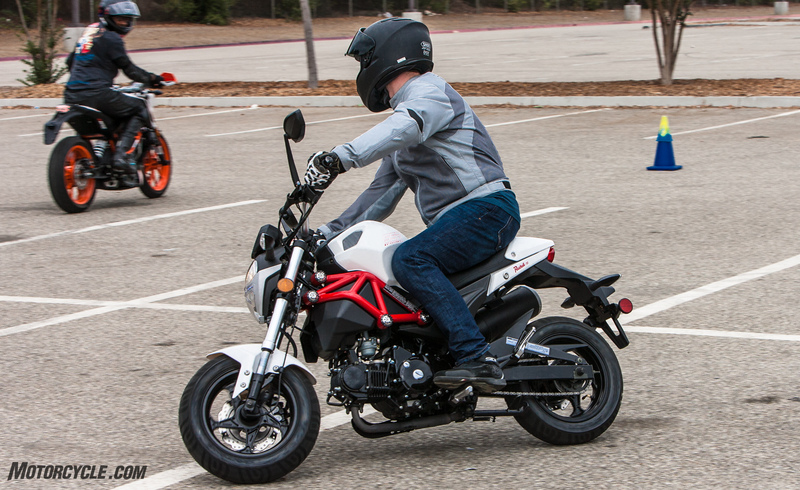 As part of the Grom’s redesign, the flat, broad seat of yore is now slightly stepped between rider and passenger. It wasn’t a particular issue for our average size riders, but something to keep in mind for taller riders if reduced legroom is something you want to avoid. 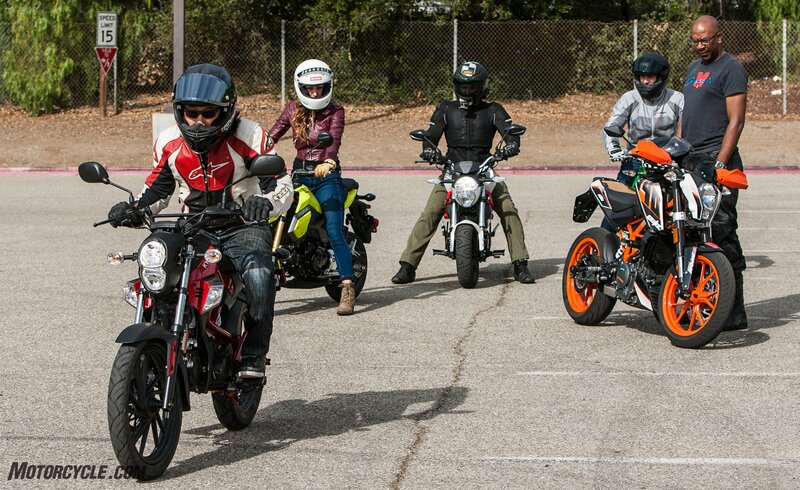 Overall, all our riders held the Grom in high regard. 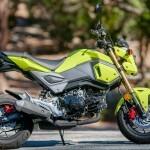 When it comes to refinement, Honda’s second to none and that attention to detail isn’t lost on the Grom. 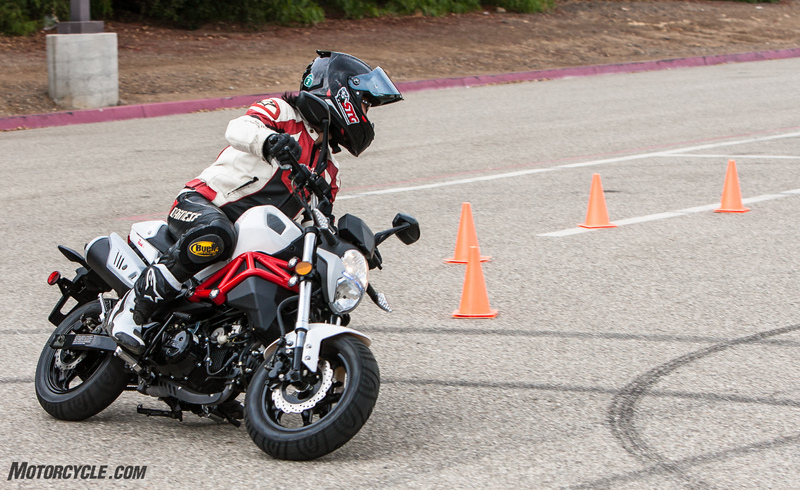 We lead off with the Grom to set a baseline. Now we move on to the other players for comparison. 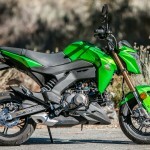 If any of these bikes are to truly pose a real threat to the Honda, it’s the Kawasaki Z125 Pro. At 200 bucks cheaper, the Little Green Machine is also a 125cc fuel-injected Single, made in Thailand, looks cool, and rides on 12s. So what’s the difference, really? Not much, it turns out, except for a few key things. 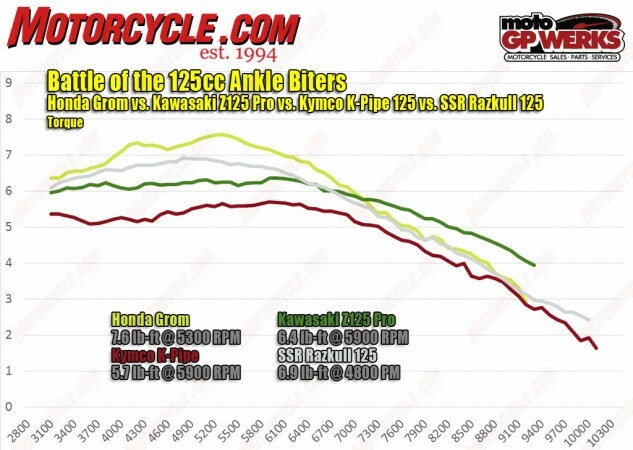 Horsepower is close to the Honda at 8.0, but it’s reached at 7,700 rpm compared to the Honda’s 6,400 rpm. 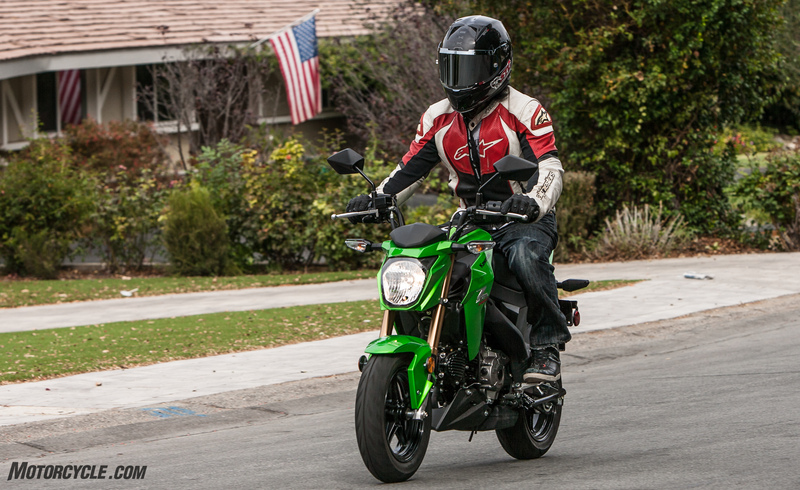 Torque is down, too – 6.4 lb-ft vs. 7.6 lb-ft – and again the Kawi takes longer to get there. 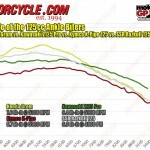 When it comes to learner bikes, though, these numbers aren’t hugely important. 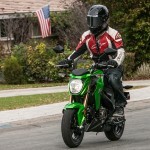 Power application is key here, and the Kawasaki is a bit abrupt with its on/off throttle mapping, something every tester mentioned even if they didn’t have the moto vocabulary to articulate it. As set up, the clutch friction zone engages further out in the lever’s travel than the others. Not such a problem if this is your only bike as you get used to it, but in the unique scenario our riders were in, swapping from bike to bike, Horejsi pointed out that it was slightly challenging. 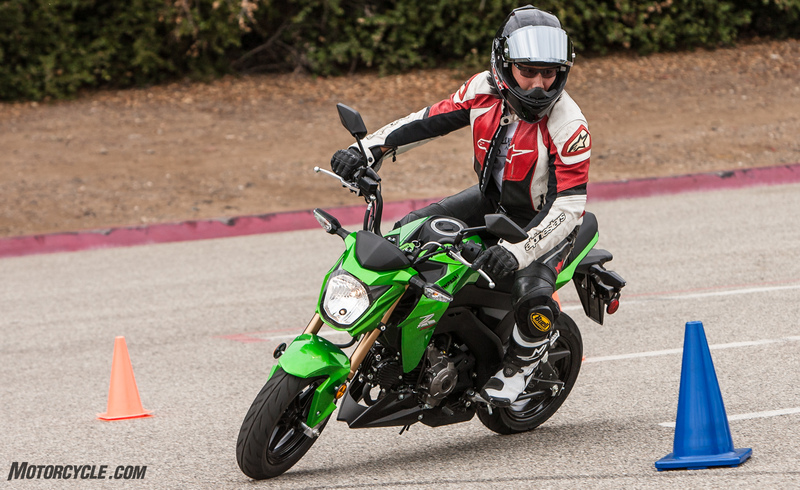 Agility is the Kawasaki Z125 Pro’s biggest asset. 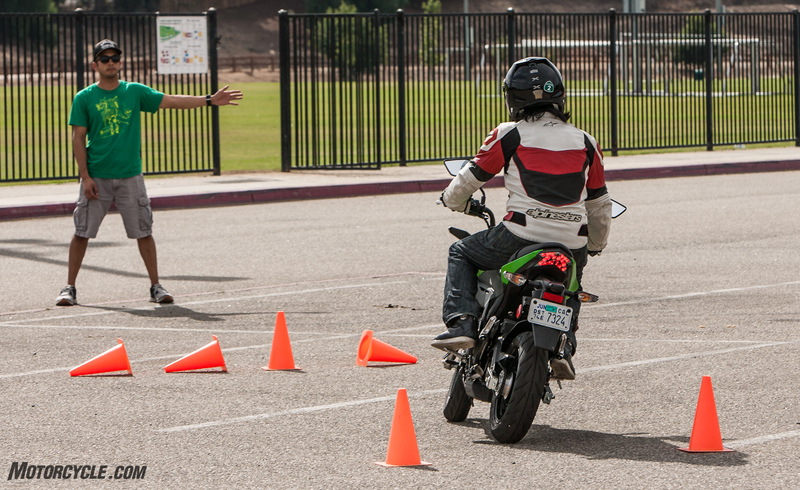 If sportbikes are in your future, consider learning the ropes on the Green Machine. 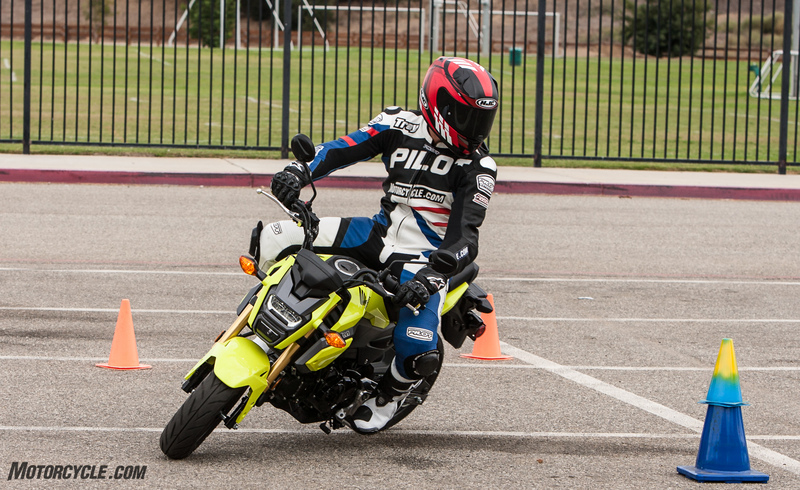 Next, the “foot controls allow for more aggressive riding,” says Trimolov. 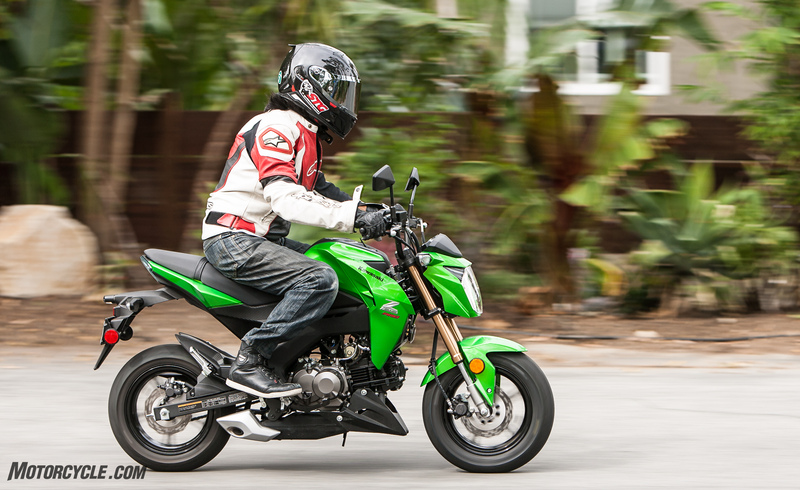 Put another way, the Z125 has the highest and most rearset footpegs here. 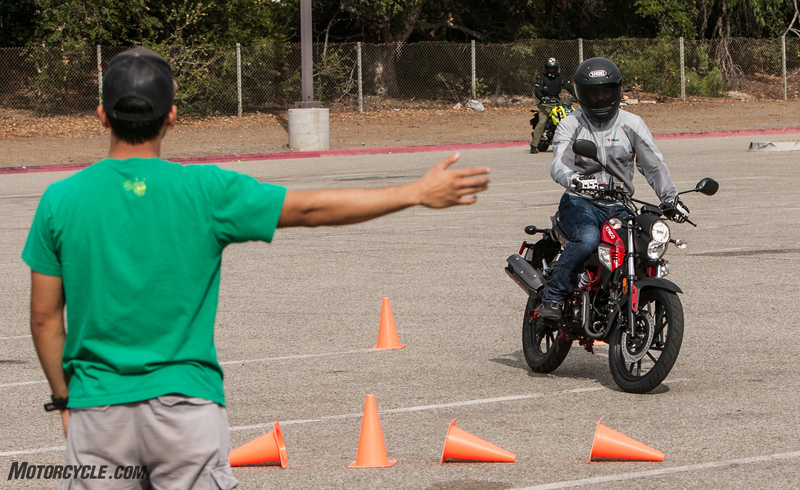 While not necessarily a negative unless you’re a taller rider, it’s something to keep in mind. 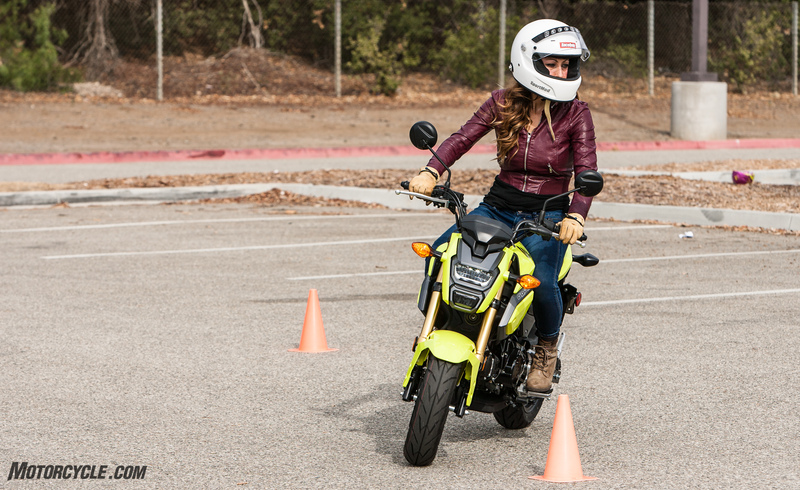 The benefit, of course, is improved ground clearance while sport riding. 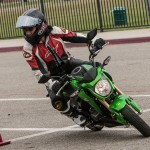 Bedrosyan seemed to like the stance the Z put him in, too; the SV650 rider gravitating towards the Green bike when he wanted to go challenge himself around the gymkhana course. In normal riding conditions the high pegs didn’t seem to bother anyone. 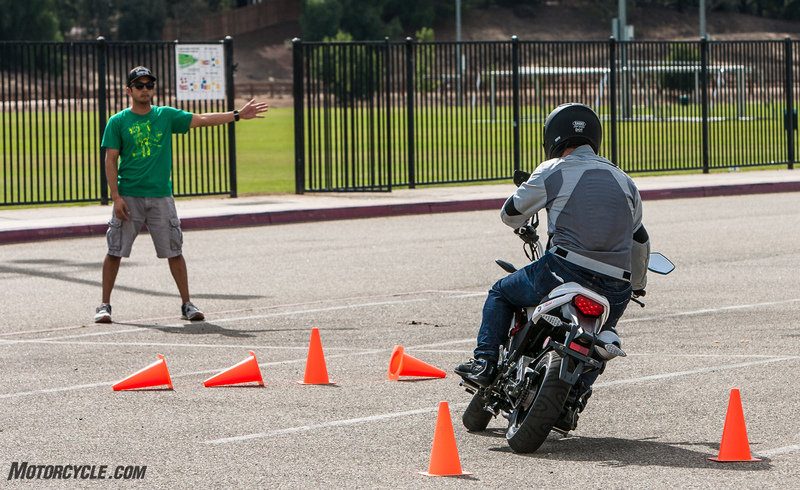 Speaking of gymkhana, the final element of a gymkhana run is slowing the bike to a complete stop within a defined box. 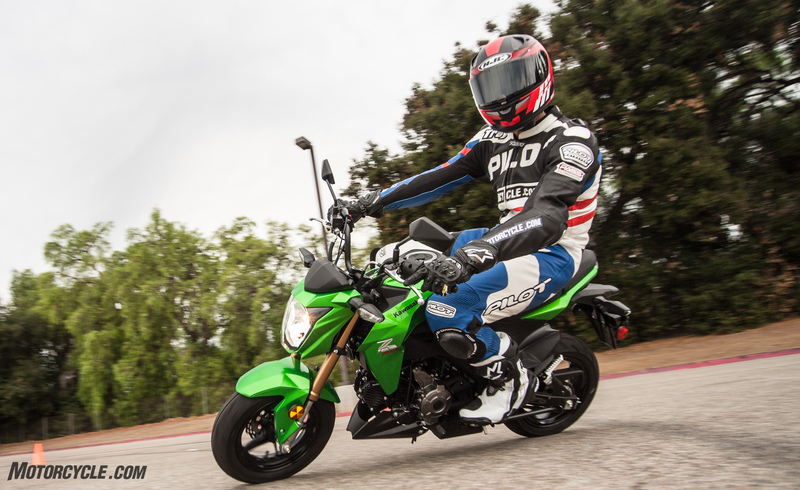 Here the Kawasaki rose above the rest with excellent stopping power but without abruptness that can overwhelm new riders. 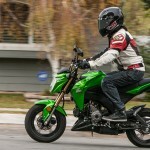 The Honda and Razkull kept the Kawi honest, and the Kymco lagged behind. 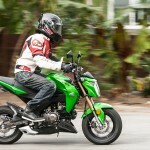 Like the Honda, the Z125’s around-town manners are pleasant, save for the clutch’s long travel. The on/off throttle jerkiness wasn’t quite as pronounced while riding around town, likely because the speeds were higher. 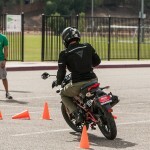 Shifting drew no complaints from our testers, though the four-speed on the Honda was marginally slicker. It wasn’t a problem knowing which cog we were in, though, as the Z125’s gear-position indicator complements one of the better gauge clusters here. 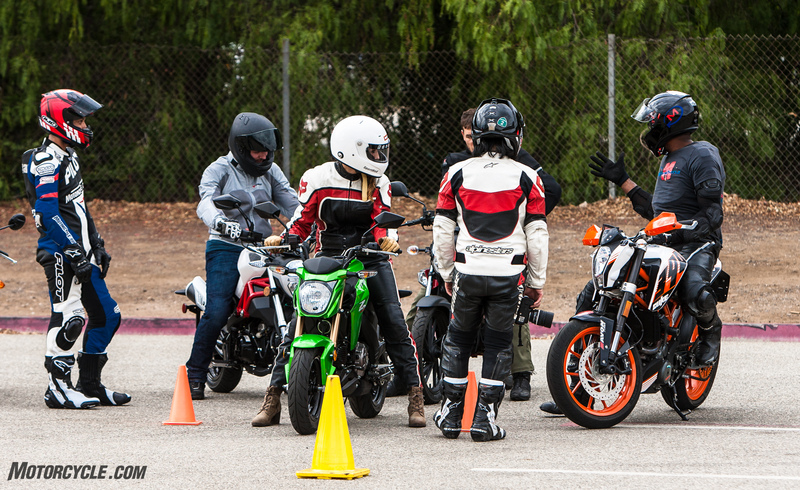 An analog tach and LCD dash provide all the vital info, and our new riders appreciated having a fuel gauge, too. With its high pegs and 100/90-12 front, 120/70-12 rear tires, the Z was the most nimble package to tackle the gymkhana course with. 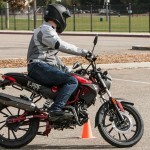 Small and narrow tires mean quick flickability, and the flat, broad seat gives adult-size riders the ability to scoot back without feeling awkward like, potentially, with the stepped seat of the Honda. 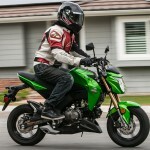 All in all, when it comes to learner bikes, there’s little to split the Honda and Kawasaki apart. A measly $200 separates them, meaning choosing one might be just a simple matter of which one looks better to you or if you prefer a certain dealer. Where this comparison gets interesting is with the contenders coming up next. Out on the range, the Kymco’s taller dimensions required an extra moment to acclimate. Seating accommodations are spacious, with ample room to move about. Once our riders got used to simply turning the throttle to move, they really took to the simplicity of operation the semi-auto trans provided. That joy was slightly offset by the K-Pipe’s lack of power, and our group agreed they were spoiled by the extra horse the Honda and Kawi gave (hey, that’s a lot in this field!). 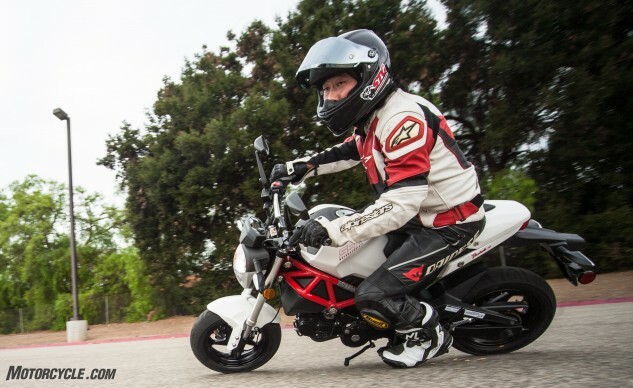 By virtue of having 17-inch wheels, the Kymco wasn’t as agile as the others, but some of our riders noted they felt more stable negotiating bends on the Kymco. 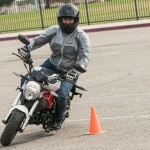 Though they didn’t know it, the sacrifice made with the 17-inch wheels in terms of agility is a bit more stability while cornering. 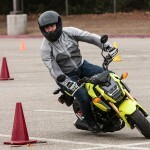 I appreciated the extra room and stability during the gymkhana portion, but I don’t foresee many folks flooding Kymco dealers specifically for that purpose. 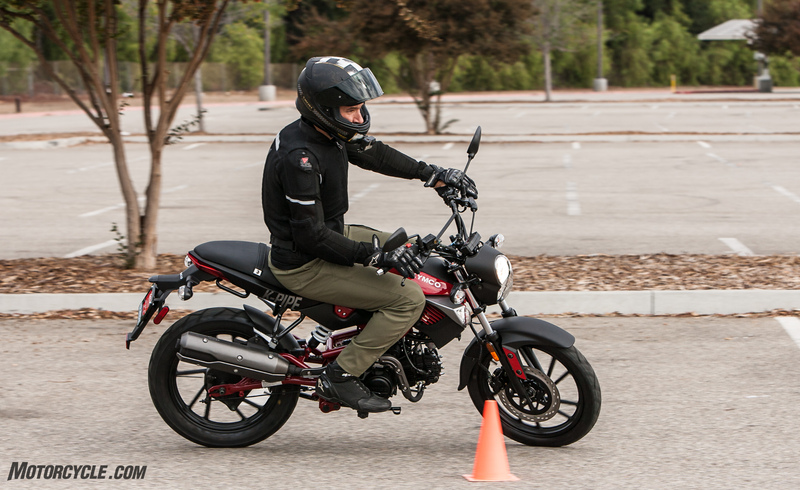 During the street ride, Bedrosyan commented how the Kymco gave a more commanding view of the road. The bigger wheels help support that opinion, as the K-Pipe feels most like a “big bike” in that you’re simply sitting higher up than the others. But most disappointing of all were the Kymco’s brakes. Soft and spongy, the front lever could come to the bar with a strong enough pull. Braking performance was obviously reflective of the weak lever (and yes, we bled the brakes). Not to be discouraged, however, as this was likely an issue with our specific test bike – the K-Pipe I rode during the 24-hour race, albeit with a steel line and upgraded pads, had phenomenal lever pressure and feel. 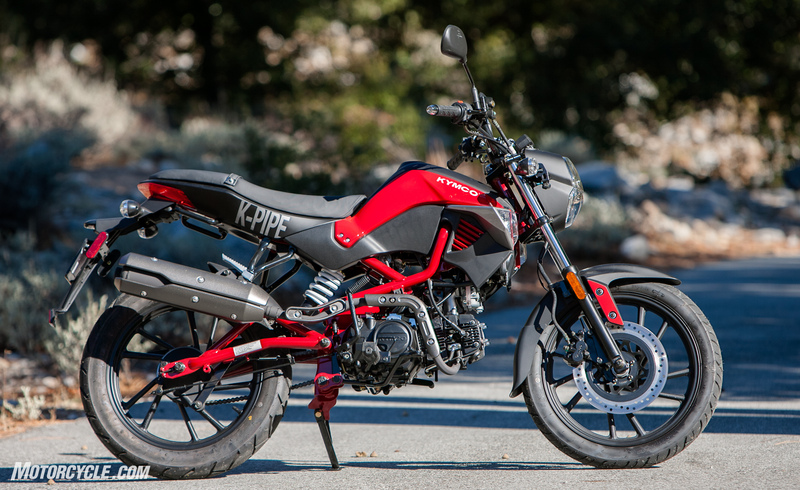 Priced at $2000, the K-Pipe feels like a motorcycle that’s $1200 cheaper than the Honda. 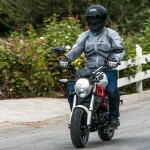 It’s less powerful, has weaker brakes, isn’t nearly as attractive, and doesn’t look as well put together – a point emphasized by the flickering LCD gauge panel that’s hard to read even when it’s working properly. 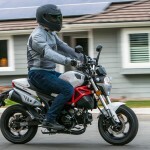 A shame, because it does have a digital tachometer, fuel gauge, and even a gear indicator. On the flip side, it’s easy (easiest for some) to ride and is comfortable, especially for those with longer legs. If progressing further in the sport isn’t a priority (or if you already have a second motorcycle to ride) and you’re simply looking for cheap transportation, the K-Pipe is at least worth consideration. 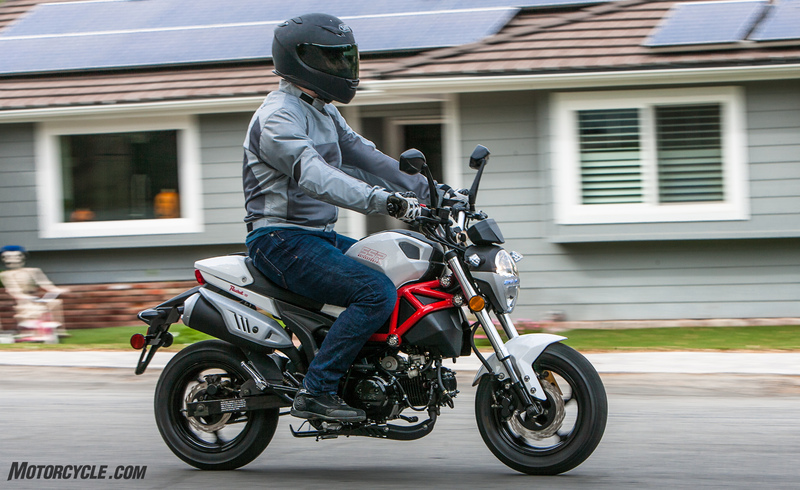 Which leads us to the least expensive motorcycle in our test, the SSR Motorsports Razkull 125 – or as we called it, the Fonster (fake Ducati Monster). 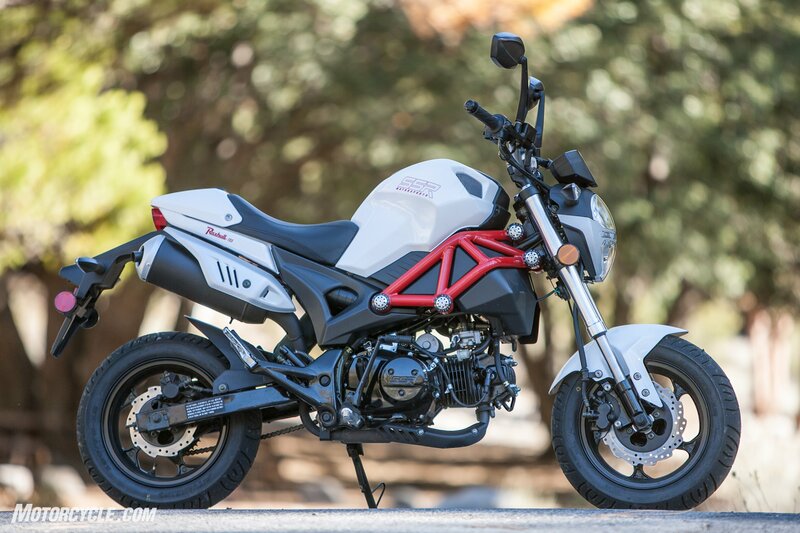 Take a look at the design of its red trellis frame, headlight and fuel tank vents, and then tell us you don’t see it, too. We weren’t sure what to expect with the Razkull, as we’re still admittedly prejudiced against Chinese products. However, the closer we inspected the Razkull, the more our opinions started to change. The SSR isn’t just cobbled together; there are no errant wires or unsightly gaps. It feels, dare I say it, fairly well built. This feeling is continued once you throw a leg over it, too. Materials feel on par with the Honda and Kawasaki – in fact, the SSR’s gauge cluster is a spittin’ image of the Grom’s – and it’s also the only bike here with a seat height lower than 30 inches – 29.5 inches, to be exact. 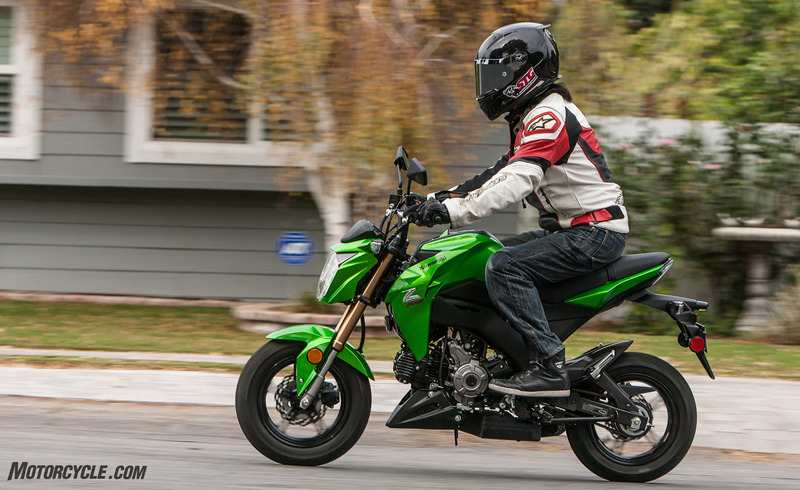 Despite the low seat height, rider quarters don’t feel cramped thanks to footpegs comfortably low and forward. 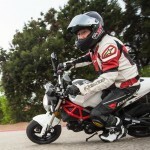 The resulting leg bend is agreeable on the street, but ultimate ground clearance when sport riding suffers as a result. 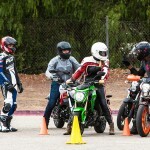 As our parking-lot day progressed, even our more confident riders started touching pegs to asphalt, something they weren’t able to do on the other bikes. The Razkull rides on 120/70-12 tires at both ends, and while it’s not the most agile, it’s not far off the Z125 and feels equally as stable leaned over even if you get to dragging pegs – an admittedly difficult thing to do for a newer rider. 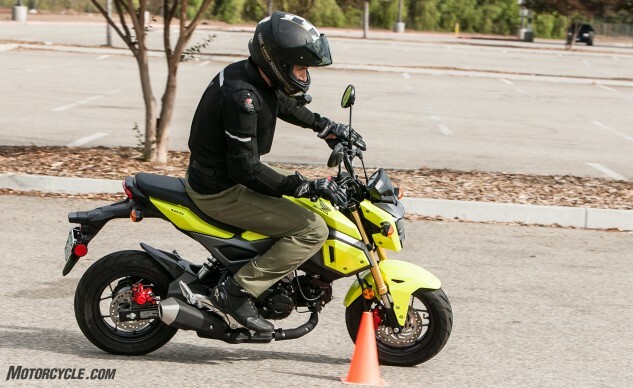 Also not far off in comparison to the Grom and Z125 are the brakes, with firm lever feel and strong stopping power. The Razkull relies on a single carburetor instead of EFI, and that’s one demerit point for it. 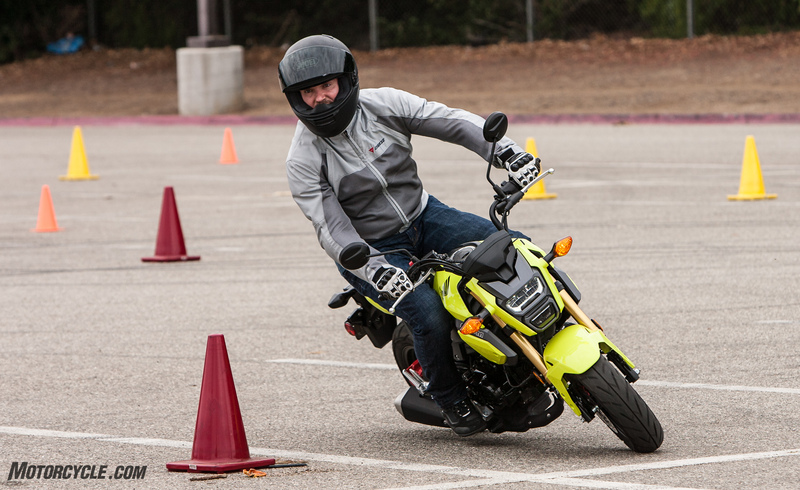 The choke lever on our test unit was seemingly useless, and our bike was especially cold blooded in the morning, requiring the need to manually keep the throttle cracked upon startup to build up some heat. Despite this, the SSR makes decent power among this lot, even edging out the Kawasaki for second place in the torque department. Power delivery is smooth, too, once warm. However, there’s no denying fuel injection is superior technology. 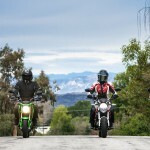 The advantages EFI provide were made especially apparent during our street ride, where our newest rider, with less than six months experience and no time aboard a carbureted motorcycle, stalled multiple times and found it difficult to restart in the heat of the moment with impatient traffic all around. So we’ve established the Razkull is punching harder than we expected for its weight class, but for $1800, surely there must be a reason it’s so cheap. 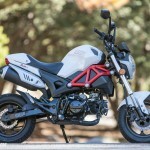 Besides the obvious points about its Chinese origins and lack of EFI, look back to the part about being fairly well built. Little things like an exhaust heat shield rattle and a sidestand that’s too long are reminders of its price. But perhaps the underlying reason for the low price is the quality of materials. 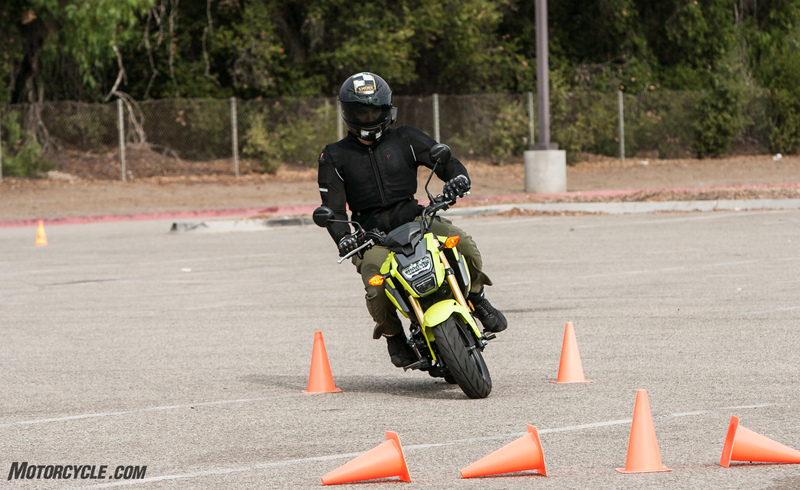 Both the Razkull and Z125 met the pavement during our parking lot drills, suffering similar damage. For the Kawi, this resulted in a bent clutch lever, whereas the Razkull’s lever snapped in half. Further, both bike’s shifters were bent. 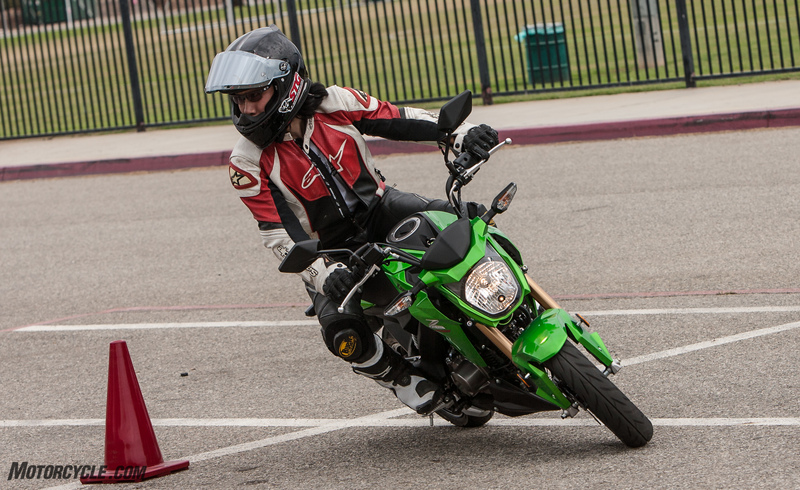 We were able to bend them back to a usable position, but the Razkull’s shifter felt much easier to bend back compared to the Kawi’s. Too many more falls and the SSR’s shifter might snap from fatigue if we had to bend it back in place again. Despite the quality of metallurgy, overall the SSR exceeded our (albeit low) expectations. 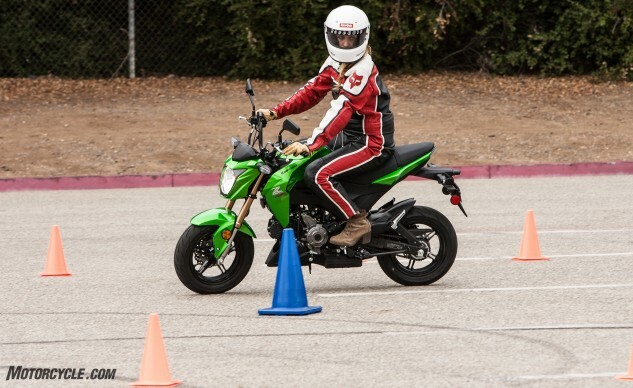 But when it comes to learner bikes suitable for new riders, Trimolov brought up a good point when he asked, “Who’s SSR?” With hardly the dealer support of a Honda or Kawasaki, the new rider looking at an SSR will have to be at least a little handy with a set of tools. Then again, the Razkull is so mechanically simple, the local mom and pop shop could get you going again should it suffer a mechanical malady. In some ways this exercise went down exactly like we thought it would. 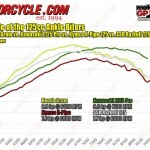 The Honda and Kawasaki would set the bar, while the Kymco and SSR would fall somewhere behind. Except the SSR fared far better than we expected it would. Its combination of looks, performance, and price make it a very attractive option, and the one I’d personally pick for my own money. 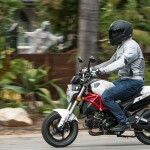 The Kymco, meanwhile, is outclassed here. 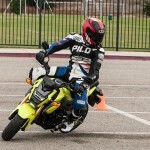 However, a case could be made for a taller rider seeking the absolute easiest pathway to two wheels. 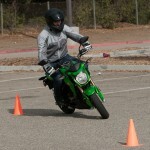 Meanwhile, the Kawasaki is perhaps most suited to the rider looking to progress to sportbikes. 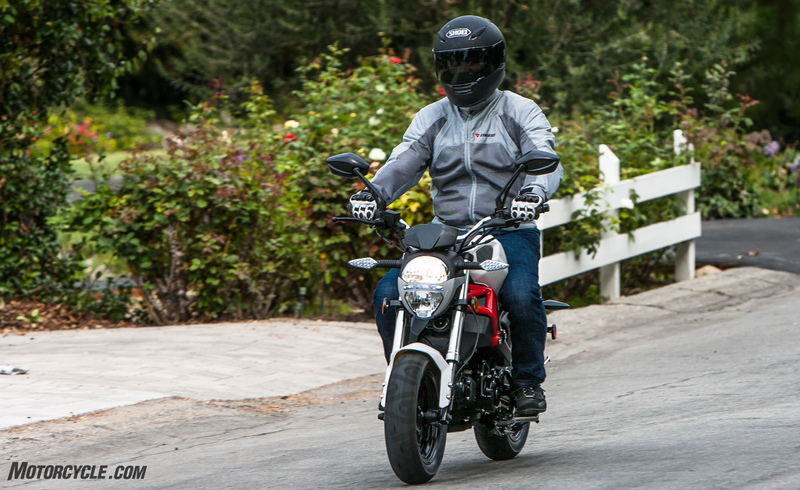 It’s the most nimble with the most aggressive stance and strong brakes. 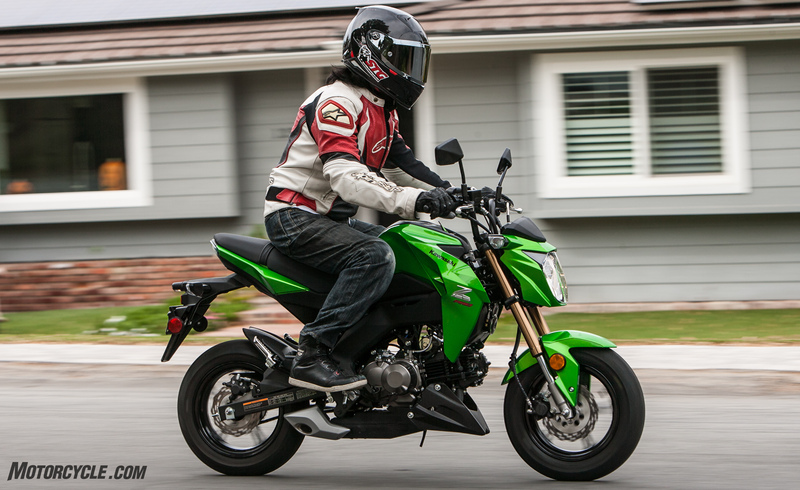 Learn to master the Z and Kawasaki hopes a ZX will follow. 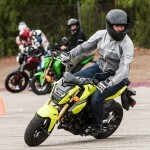 The OG of the minibike fad, the Honda Grom still rises above its challengers. 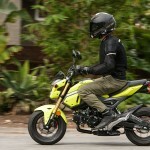 Still, Honda’s Grom is a remarkable little motorcycle with the quality you expect from a Honda. 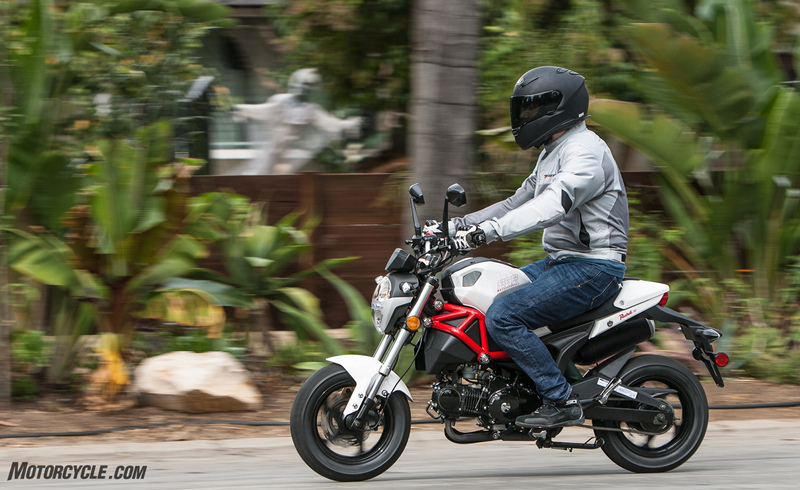 It makes more power and torque than the rest and it offers no negative surprises. Everything simply works like it should, which is great for someone who only cares about riding, not wrenching. 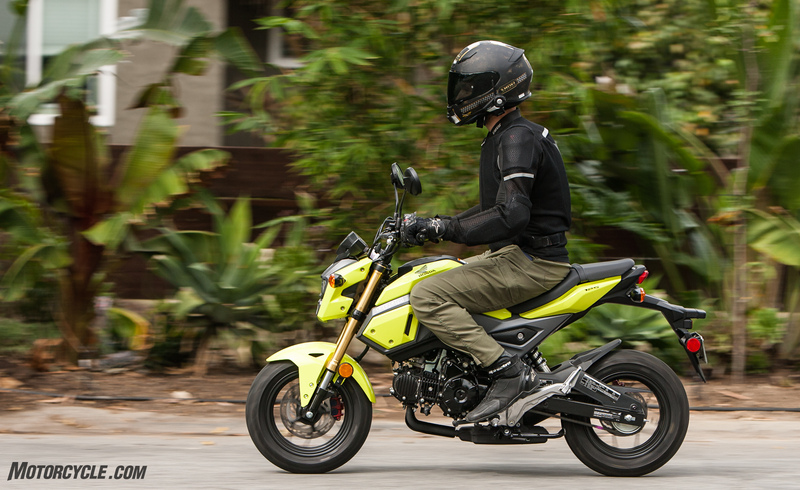 At $3,200, the Grom is a big pill for the wallet to swallow in this category, but we can’t deny it’s the best of the four. Front Brake Single 220mm disc, dual-piston caliper Single 200mm petal-style disc, dual-piston caliper Single 276mm disc, dual-piston caliper Single 220mm disc, two-piston caliper. Curb Weight 231 lbs 226 lbs. 247 lbs. 247 lbs.